OneNote comes with Microsoft Office in Windows 10. It is very helpful for people who wants to keep note of various things they do. OneNote can also be shared with others over the internet. Currently Windows 10 users having recently installed the update are Experiencing 0xE00015E0 Error Code. This Error pops up every time users try to open OneNote. It is not a error that is displayed only once; Re-Opening OneNote doesn't help as you will see error 0xE00015E0 each time. With the Recent update, we found there is problems with User account/Email account. We will share Couple of methods to Fix this issue on your own very quickly. 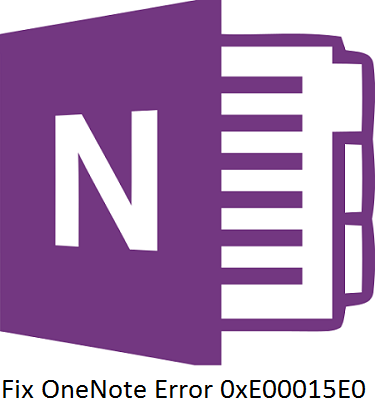 Fixing OneNote Error 0xE00015E0 Easily. As Discussed earlier OneNote Requires you to Verify your Microsoft account again to work properly. Again, OneNote Needs to change few settings to work smoothly with recently updated Windows 10. Below are the Methods to fix this issue. Step 1: Go to Start > Settings > Accounts. Step 2: In Accounts, you will see your Email and account. Just there, you will see Verify your account link. Click on it. Step 3: After Clicking on Verify Account, You will have to enter your Microsoft account Password again. Just enter it correctly. Step 4: Go Back to OneNote and open it. This time, you will not see error 0xE00015E0. Verifying account must work for you seamlessly but if it doesn't, You might want to skip to Method number 2. Method 2: Test & Change Settings to fix 0xE00015E0 error. There are Programs on your PC which are made for the Previous version of Windows, If you are getting error 0xE00015E0 on OneNote after Recent Windows Update, then you can try this fix. Under Programs Click on Run Programs made for Previous version of Windows. List of Programs will be displayed to you. Click on OneNote. Let it Test and one it is finished, You will be asked to make the changes. Do the Required Changes and that is it. Now Open OneNote and see if you are still getting error 0xE00015E0 on your PC. Performing above steps should fix it for you. 1) Run OneNote as Administrator. 2) Sign out and Sign in again in OneNote. Method #1 or #2 Should most probably fix your OneNote error Code 0xE00015E0. But if it doesn't then you can try Few more thing that I have mentioned above. If this Post helped you to fix the issue, then let us know in Comments. Which method worked for you?